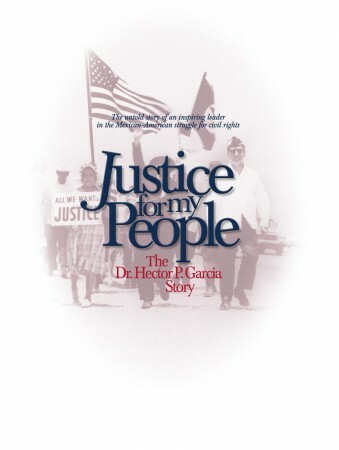 "Justice for My People," for which Professor Maria McMath served as associate producer, tells the remarkable life story of Mexican-American civil rights activist Hector P. Garcia. Hector P. Garciaâ€”a Mexican-American physician who fought for equality and desegregation in Texas and the Southwest throughout the 20th centuryâ€”may not be the most recognizable name in the history of civil rights movements. But Visiting Instructor of Anthropology and Peace and Conflict Studies Maria McMath hopes that the documentary“Justice for My People: The Dr Hector P. Garcia Story,” which premiered nationally on PBS in September, will make him a household name. The film, on which McMath served as associate producer, tells Garcia's story through photographs, archival footage and interviews with his contemporaries. Garcia was a Mexican Revolution refugee and decorated war hero who, upon returning from WWII to settle in Corpus Christi, Texas, found his people facing public school segregation, squalid living conditions in labor camps, and second-class citizenship. He became a doctor to the barrios and founded the American GI Forum in 1948, empowering Mexican Americans to fight legal and political battles against discrimination. In the early â€˜60s, President John F. Kennedy appointed him ambassador to a West Indies treaty signing, and in 1967, President Lyndon Johnson appointed Garcia as an alternate ambassador to the U.N., before which he gave the first speech by an American delivered in a language other than English. In 1968, he was sworn in as the first Mexican American to serve on the U.S. Commission on Civil Rights. President Ronald Reagan presented Garcia with the Presidential Medal of Freedom in 1984; he was the first Mexican American to receive this honor. Hector Garcia died in July 1996 in Corpus Christi. Many of Maria McMath's role models, like Garcia, are from the WWII generation.“They were fighting for strong issues, of rights, education, freedom, voting access,” she says.“These pressing issues still exist today, but for some reason the fire of the fight has gone out of people.” She also admires the fact that many WWII veterans, particularly veterans of color, like Garcia and her own physician grandfather, pursued their education courtesy of the GI Bill and made something out of themselves using any and all available resources. McMath first learned about Hector Garcia as an undergraduate at Swarthmore, in an“Introduction to Latinos in the United States” course still taught by Professor Miguel DÃ­az-Barriga, who later became her mentor and nominated her for a Mellon Mays Undergraduate Fellowship. DÃ­az-Barriga also introduced her to nonfiction film as an instrument for education and social change, which led McMath to apply for the associate producing job at PBS just after graduating from Swarthmore. McMath's next project is an oral documentary for NPR or RFI (francophone public radio) about French rap music, the subject of her doctoral dissertation.“Hip-hop culture has become overwhelmingly visual, and I want to bring listeners back to both the oral and aural dimensions of the music.” Recent civil unrest in Paris will provide a timely context for her exploration. In the near future, she hopes to complete a documentary on the Underground Railroad, and its rich history in the Philadelphia area. â€œWorking on projects related to civil unrest in the past and present, I hope to better understand and care for civil unrest in the future,” she says.